The oldest commissioned warship afloat in the world became known as Old Ironsides during the War of 1812 when she fought the British Frigate HMS Guerriere and cannonballs fired at the USS Constitution merely bounced off as if she were made of iron. The durability of Constitution is attributed to a three-layer sandwich of wood from all across America. The shipÂ’s copper fastenings were constructed by Paul Revere. Constitution put to sea, after two false starts, in 1798, four years after construction began. The USS Constitution is a well-traveled ship, having patrolled the West Indies, Brazil, and the West African coast and participated in the Barbary Wars. The ship is permanently berthed in the Charlestown Navy Yard and ventures out six to eight times a year into Boston Harbor. At one time, it required a crew of 500! Today, it is a fully commissioned ship with a crew of 70. Constitution was considered a super-frigate in that she could out-gun or out-run anything she encountered. Rated at 44 guns, she typically averaged much more than her rating by carrying between 50 and 60 guns. She was crewed by many more men than comparable foreign frigates and had a top speed of 13 knots. Her diagonal riders, supportive ribs running laterally towards her centerline in her bilges and a huge technological advance, allowed her to carry guns much heavier than other frigates. 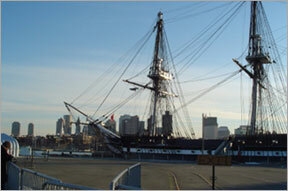 Learn more about the warship at the USS Constituion Museum, located on the Freedom Trail.